So...I have been absent for a while, truth be told January is kind of a blah month. In our house we have been dealing with colds and outside is our lovely winter inversion(which means we haven't actually seen the sky in several weeks). So I will be, happily bid January farewell and begin looking forward to spring. I did watch the inauguration and I must say my favorite part was the introduction of the Carter's, or should I say Miss Rosalynn and Mr. Jimmy Carter. There were several things I loved about them. First Mrs. Carter wanting to be introduced as Miss Rosalynn, it may not get any cuter, but my absolute favorite was when the standing in the opening waiting to walk down the stairs and she grabbed her purse in both hands (with the look on her face like why did I bring his big old thing), then Jimmy offers to carry it for her. 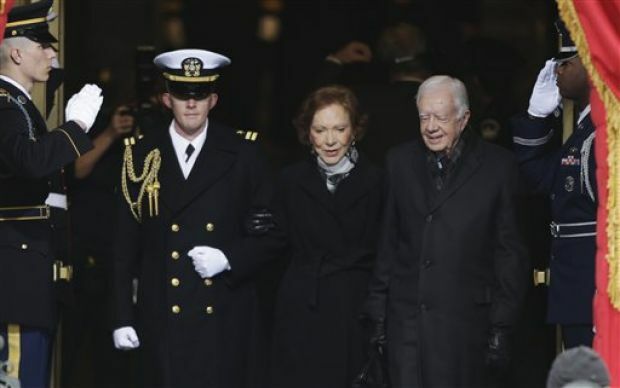 So there we go it does get cuter, Good ole Jimmy, ex-president, walking into the inauguration carrying his wife's purse. Love. That just goes to show we need more peanut farmers to step up and be president. I would also like to add to all of the royal obsessed Americans, this inauguration shows that we have every bit of fanciness, and ceremoniousness as they do. It was a beautiful day. So with a congratulations to President Obama I bid farewell to this month, look forward to seeing the sunshine soon, and look forward to Valentine's day (which I have always been a fan of, even when I didn't have a Valentine). I didn't see that! How wonderful. What a good and decent man he's always been.